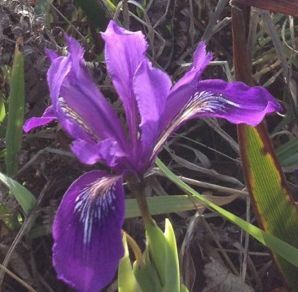 The beautiful Douglas Iris (Iris douglasiana) is a member of the showy Iris family that blooms from February to April along the grassy slopes of the California and Oregon coastline. These wild flowers are blue-purple. The Douglas's Iris grows to a height of three feet. Both floral tube and pedicel are of nearly equal length (1-2 inches).